Oh my goodness! After market has been a busy time here and my family is just putting up with me and my messes, which have covered the first floor of the house. And see those big Bernina boxes in the background? I picked up the Bernina 780 from Sew Much Fun and get two weeks to try all the new features. Is it possible to be in love with a bobbin case? I do – I do – I LOVE this bobbin case. It sews so smoothly and is impossible to thread the wrong way, even for me! Two weeks is just not long enough with this machine. I get to try all the new software too – DesignWorks Suite includes CutWork, Crystalwork, and PaintWork! I’ll be talking about that here and on We All Sew in late December. 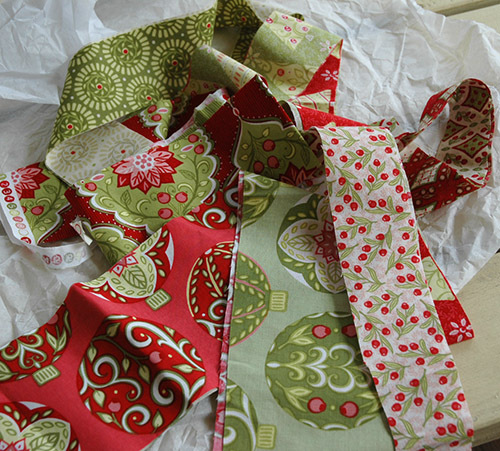 And on top of that there is a new collection to finalize and I just received strike offs from Blend Fabrics for my new Christmas collection – Holiday Bouquet. It will ship in spring. I hope you like it. The ornaments will be so fun to applique! Hope everyone is enjoying their sewing time and getting lots of it! Wow! 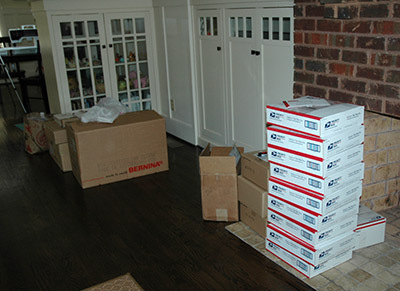 All those boxes to ship! Looks like you had a great market experience! Way to go! I would love a bobbin case too, I do not see that as odd at all! I am looking forward to your Christmas Collection, what I see looks wonderful! Woo hoo, have fun playing with the new 780 and software. I'd certainly love some hands on time. Have the 730E, Cutwork Software and V6. Still, interested in hands on time with these new products…..in the meantime I look forward to hearing your insights. Oh my, another collection that I will want to have every print of. The sneak peaks look terrific. Sweet! Looking forward to hearing about your adventures with the Bernina! Love the Christmas fabric line…the ornaments are wonderful!